Save time and money without sacrificing quality with the Canon PGi-5BK / Cli-8 Compatible Ink Cartridges Multipack from InkColour. This bundle includes ink tanks compatible with the Canon PGi5 and CLI8 and fits all the same Canon printers. These high-capacity CLi-8 ink cartridges include black, yellow, magenta and cyan colours, each with 14ml of fluid for more than 200 printed pages. 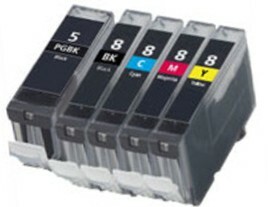 PGi5 cartridges contain 28ml of fluid and can last for up to 600 pages of black and white copy. Get crisp, sharp text and full-colour photographs and images with cheap Canon PG5bk/CLI8 ink. Compatible Canon ink resists fading or smearing, even with frequent document shuffling.